I’m sitting here drinking a diet cola. I have no apologies, and I have no regrets. You can stop reading now if you feel very strongly about the issue, but I hope you’ll read on. I think the question of whether we drink diet sodas, and how we sweeten our food in general, is an important one for people following a low carb high fat diet. One of the things a lot of my readers ask me about is the fact that I’m comfortable using artificial sweeteners in many of my recipes. 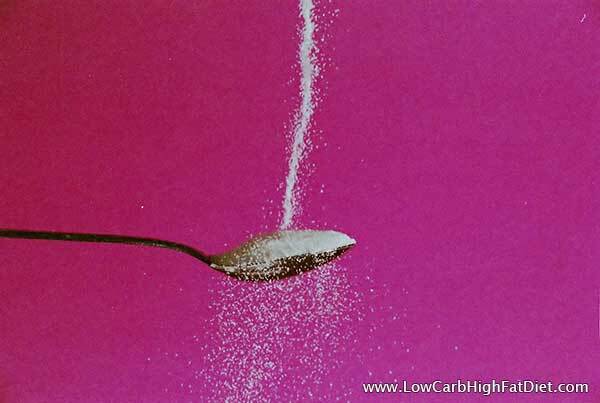 Artificial sweeteners are controversial in low carb high fat dieting. Some people believe that just having a sweet taste in your mouth is enough to trigger insulin response. Some say that if you eat something sweet, it triggers the desire for other things that are sweet simply because of the sweetness in your mouth. It’s also been claimed that the body starts to crave actual sugar if sweet tastes are introduced, but not followed by the physical responses that indicate actual sugar has been consumed. Artificial sweeteners have even been indicted for causing unhealthy changes to the natural flora and fauna in our gut. And for some of us, any of that may be true. One of the things I always tell people is to figure out what works for you, and then follow those rules. For me, artificial sweeteners provide a welcome break from the pattern of salty and hot flavors on a low carb high fat diet. In some ways, I don’t sense a lot of difference between the sweetness of an artificially sweetened drink, and the sweetness of biting into freshly grilled asparagus, and I don’t think there’s anything radical or dangerous about incorporating different tastes into my diet. I like to have variety in my menu, but even the idea of having a wide range of flavors and dishes can be controversial. There are some low carb high fat diet advocates who say that it should be a goal to have as limited a menu as possible. I think the goal is to help us avoid thinking about our food. That would be useful if thinking about food made us hungry. However, when you’re following a low carb high fat diet, the appetite is naturally suppressed. I find it important to create stimulating and engaging foods. I also like to make sure that my food engages all five senses. I like the crunch in my mouth, the bright colors on my plate, the strong smell, the weight and the texture of the food on my tongue, and of course the taste. Years of cooking have taught me many techniques for bringing out the best in a variety of foods, and I see no reason to stop doing that just because I’ve decided to limit the range of foods to ones that are healthy for me. Artificial sweeteners were never a normal part of my diet before I started low carb high fat eating, if you don’t count drinking diet soda. (I could never stand the taste and effect of full-sugar colas. But I never bothered with artificial sweeteners for anything else.) Now that I’m using them, I’ve discovered that they have a variety of differences and advantages over regular sugar. One of the first things I noticed when I started sweetening my foods with artificial sweeteners instead of sugar was that the artificial sweeteners give up their sweetness much more easily. For example, my usual approach to make a sweetened cup of tea is to blend artificial sweeteners, such as saccharin and aspartame. The saccharine cuts the acidity of the tea, and leaves room for the aspartame to flow through with the sweetness. But on a carb reload day recently I tried a cup of tea with regular sugar, and I was shocked at how much sugar I needed to add in order to get the same sweetness. The effective sweetening with artificial sweeteners is much more profound. You use a very tiny amount, but it releases a great deal of sweetness into the mouth. The fact that you don’t also get the sugar rush means that you can enjoy the artificial sweetener, making your foods just as sweet as you want, without the negative side effects. Experimenting with a variety of artificial sweeteners, I’ve landed on a couple that seems to be my favorites. For baking, I love erythritol and stevia. Erythritol is a little bit tricky to work with, because it’s not very sweet, but it has some great properties. The way they that it dissolves and browns is very much like sugar. As somebody who bakes, I find that reassuring. Stevia brings with it some subtle back flavors almost like anise. In the right context, that can be very appropriate, but it can quickly be distracting. I think liquid Splenda is probably my favorite sweetener right now. Unlike powdered Splenda, it provides absolutely no carbohydrates, and a very small amount delivers a great deal of sweetness. You have to be cautious not to use too much, or the sweetness will overwhelm anything that you’re eating. I’ve also experimented with some of the more exotic sweeteners. I’ve tried the monk fruit extracts, but I’m a little less confident about it. It’s not as sweet as Splenda, and I haven’t figured out if they have an effect on my body yet. And I still use saccharin for some things, tea being an excellent example, but for the most part it’s not a big part of my diet. The point is that I’m not giving up on artificial sweeteners just because I’m eating a low carb high fat diet. For me, having sweetness in my diet is useful. It provides interest and variety, and helps combat the appetite suppressing qualities of low carb high fat eating. I’m curious what experiments you tried with artificial sweeteners. Did you just stop using them completely because you were told that they were wrong? Did you find the using them actually had an effect on your blood sugar? Did you notice a psychological effect from using sweeteners?